R type INTERCOOLER, Core Size/Location: 400X260X65/2/Front mount, Can install to a carbon air guide-less and a left-hand drive car. Not checked for SPEC V.
An air ductless addition to the intercooler kit for Nissan GT-R R35 spec. This product is for those of who want a reasonable price tune-up. 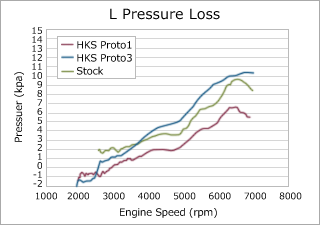 The performance of intercooler of stock is fine for normal stage, but for the tuned car of 1.2k boost-up (GT570, GT600 kit) can reach high temperature rapidly because of near flow capacity limitation of turbocharger which is that the stock core size is small capacity. To improve the cooling performance, more core capacity is required but a little bigger intercooler than the stock could not provide enough cooling performance. Therefore we have employed size of 400x260x65 and thinner core type for much better cooling performance. 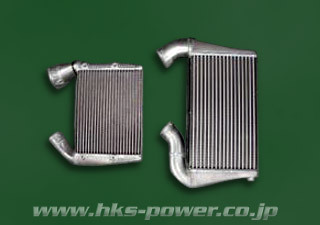 HKS Intercooler is lighter than the stock Intercooler that gives over-hang weight trimming effect. For losing pressure by the thinner core design we have revised inner fin to keep down the increasing pressure loss. For the large capacity core, the air to radiator cause problem of rising temperature. We have solved this problem by making the core thinner which increases the speed of air passing through the radiator. We have tested at racing track with racer driver and confirmed the water temperature. GT-R R35 VR38DETT 07/12- R type INTERCOOLER 400X260X65・2・Front mount 13001-AN014 Can install to a carbon air guide-less and a left-hand drive car. Not checked for SPEC V.